The first picture shows the rather sad, old bag I started with. I gave it a coat of Studio Gesso, all over including the handles, and already it was looking possible. Being somewhat impatient, I dried it with my heat tool, and then waded in with the paints. I chose, landscape Green, Purple Palette and Painterly Pink and applied them with a broad flat paint brush, in overlapping patches. Once dry, I repeated painting of the other side, varying the layout of the colours slightly. I then chose some of the fabulous stencils I've received in in my DT packages from Kim. Here you can see Wendy Vecchi's Dots and Stripes, Crafter's Workshop Mini Harlequin and a Donna Downey Flower stencil. I used Antique Linen Distress paint and positioned the stencils in places where the colours butted up against each other. I think this helps to 'meld' it all together. I quite liked it at this point but .... why leave it there when I was having so much fun? 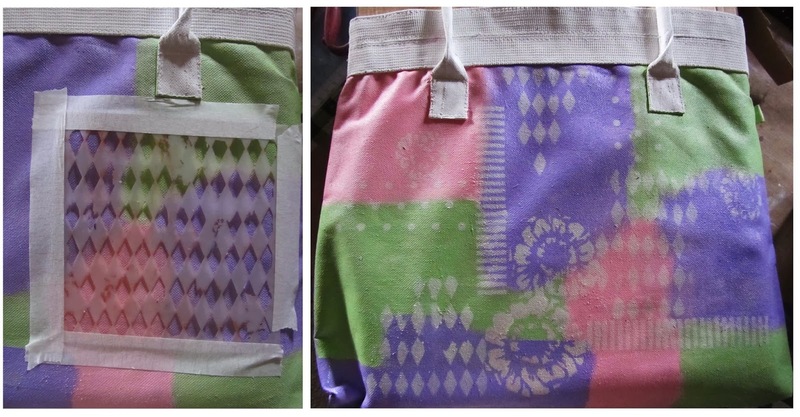 I love the technique of stamping on tissue and layering it onto canvas, so I decided to use this on the the surface of the bag. 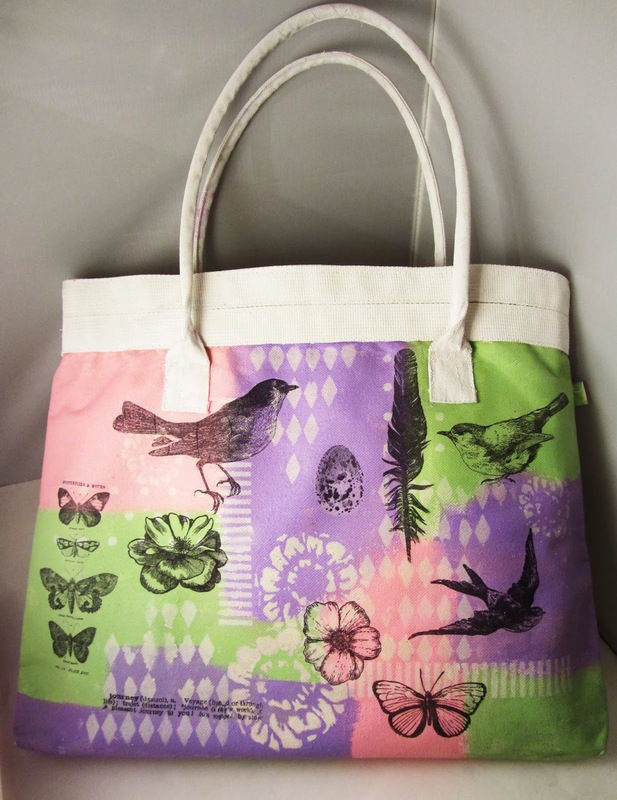 As the bag has lovely spring like colours, I thought it would be fitting to break out the new Tim Holtz Bird Feather stamps. I also delved into my stamp collection and found a selection of other botanical stamps. 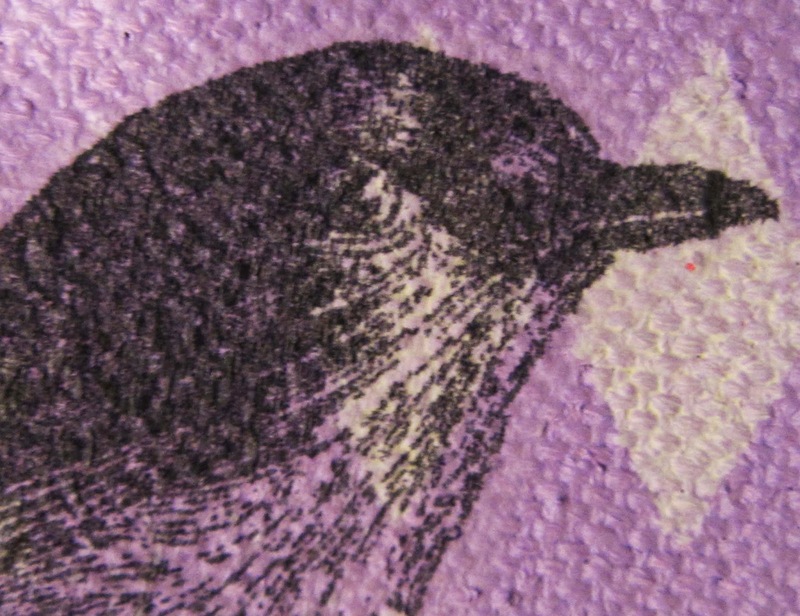 I stamped onto several tissues, using black Archival ink. To finish off, I added a little Maya Road wooden tag which I first painted white and then stuck on a little bird charm I made by stamping onto a piece of Polyshrink and heating to shrink the image. Just gives it a classy finish! Here are some of the supplies available from the eclectic Paperie Shop, which I've used on my project. Good Luck ! Oooohhhh love your bag! Love the colors and I'm thinking I have several bags..... I'm definitely playing along. Oh my giddy aunt how awesome that bag turned out Toni!! I would pay good money for that from a shop...woohooooo Toni you rocked this!! Love how you showed the how to as well. Will be playing along for sure. Love the colors and the images freakin' rock girlie!!! I didn't even think of the tissue paper thing on fabric! Genious! Pure GENIOUS!!! Thanks for stopping by my blog today - I love your genius plan. I wont be able to attend Tim's South African stint because both shows are not in the province that I live in and it is going to be too difficult to juggle my work schedule around it. I do like your evil plan though, to get some of those stencils......Great bag - love how you turned it into a piece of art. Oh my goodness, first of all stenciling on the overlapping color ares, genius! The colors just completely blend together! 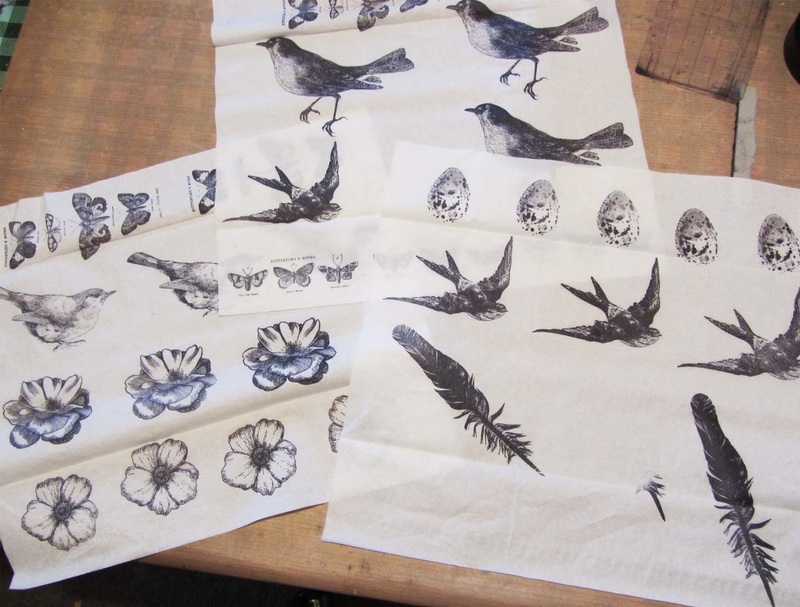 Secondly, tissue paper and stamps is also a favorite of mine ... but putting the tissue on the bag, genius again!! Love, Love your bag!! I love your bag! Great technique. I will have to try it. Wonderful colour blocking and those new stamps look stunning (mine are en route!!)... fabulous transformation. LOVE LOVE LOVE your bag, Toni! The colors, the stencils, the tissue, and all of the new products I MUST buy ~ WOW! Shrinking the bird was genius! THX for the inspiration!